Words like marketing, advertising, branding and promotion get thrown around a lot in the music industry. What exactly is the difference? Why is there any differentiation at all? Before we get to marketing, first, I’d like to explain what advertising is. The reasons for this will become a lot clearer in a moment. Advertising comes in a variety of different forms, whether it’s a commercial on TV, or a billboard alongside the highway. Advertising is almost always paid for, and that’s one of the main things that differentiates it from promotion or marketing (by the way, the words “promotion and “marketing” tend to be used interchangeably these days, even if they held different meanings in the past). Online advertising has grown in popularity by leaps and bounds in the last few years. You can have ads up on all of your favorite places like Google, YouTube, Facebook, and many, many others without having to invest millions or even thousands of dollars. Advertising allows “The Average Joe” to play a much bigger game than he might be able to otherwise. Let’s say Joe has a website where he sells his music. On average, he only gets five visitors per day. He’s not selling much music. So he pays for an ad on YouTube. People love it, and pretty soon he’s sending thousands of visitors to his website, and some of them are even buying his music. Joe is a much happier camper now. This is a fairly frivolous example, but this is pretty much exactly how advertising plays out. When businesses, entrepreneurs and individuals want their products or services or events to be seen by bigger markets, they’ll sometimes pay for the privilege of being positioned in a more prominent place. The great thing about online advertising is that tracking and measuring the effectiveness of your ads is easy. Most platforms will give you detailed stats during and after your campaign, which means you can measure exactly how effective it was. If you want to be strategic about your ads, you have to figure out what your audience likes to watch, listen to or read, and take an ad out with the business or individual that’s responsible for creating the show, the book, the magazine, or whatever the medium may be. The same goes for online advertising, where the idea is to determine where your audience hangs out online, and serve ads at those sites and blogs. In summary, advertising is marketing you pay for. Ads can be seen all over the place; in newspapers, in magazines, on blogs, on billboards, on TV, and so forth. How you are positioned in the marketplace is determined by your budget, and the agreement you have with the ad provider. Marketing is more holistic and all-encompassing than advertising. That’s why it makes sense to talk about after advertising. Marketing includes every aspect of your efforts to promote yourself or your music, up to and including advertising. Whether you’re putting on a concert or writing a new blog post, it all falls under the umbrella of marketing if it promotes your music in some way, shape or form, directly or indirectly. Marketing takes a lot of different shapes, especially online where we hear a lot about content marketing, social media marketing, SEO, and other types of online marketing. There are also terms like offline marketing, which refers to any marketing that is not done on the internet, and digital marketing, which refers to the practice of getting your branding or marketing message on screens and other digital technologies. At the end of the day, you don’t really need to know how the different types of marketing work. It’s good to understand what’s available to you as a musician, and you might be able to take advantage of new methods, but a lot of the tried-and-true strategies still work. I’ve talked about the fact that I think music marketing should be ongoing before. The idea is this. Once you start marketing, you should never stop. We have a tendency to think that music careers happen in cycles, when in fact all aspects (planning, creating and marketing) tend to happen simultaneously. It’s a good idea to make your own marketing plan, so that you have a blueprint to follow on a daily basis. Nothing is more frustrating than coming to your desk with the intention of getting something done, only to waste 30 minutes on Facebook and 15 minutes on email. When you have a workable plan in place, you’ll waste less time on things that don’t matter. In summary, marketing encompasses everything you do to promote your music. If what you’re doing could lead to more exposure for you and your music, it’s considered marketing. Marketing is an absolute necessity in the music industry. I’ve talked about the difference between distribution and marketing before, and the gist of it is that you can’t just put out an album and hope that everyone will buy it. You have to put activity behind a new product or new release, and that activity should include marketing. I would encourage you to become acquainted with the latest practices in online marketing. I recommend against getting too unfocused and trying everything, but you should always be learning about the latest methods so that you can take advantage of them when it makes sense to do so. What are your thoughts? 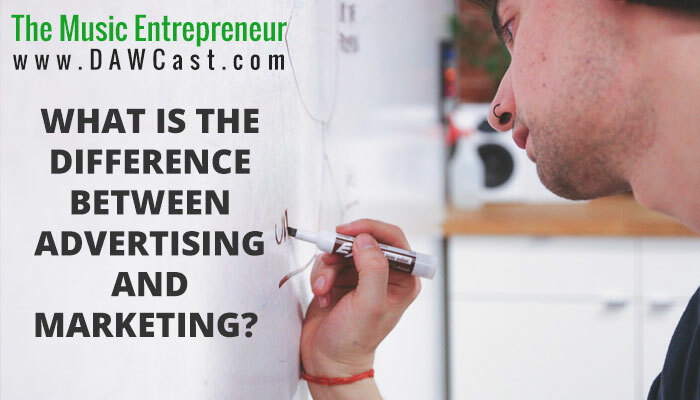 Do you understand the difference between advertising now? Do you have anything to add to this discussion?